Just because it is Valentine’s Day, doesn’t mean kids have to be loaded up with sugary sweets. There are so many other alternatives out there that are fun but not candy-related. Here are some non-candy Valentine’s Day ideas for kids. These little trinkets and treats can be placed in small Ziploc bags and signs and sayings can be stapled on these bags. What are your favorite non-candy Valentine’s Day ideas for kids? Tell us in the comments! Kids love popcorn so because of this, they make the ideal Valentine treat. You just need some single serve bags of popcorn and a label that says, “To a popular friend” or “You make my heart pop.” Tape or staple the label to the single serve bag. Place some apple slices in some Ziploc bags or just purchase individual bags of apple slices. Apples are healthy, and kids love them. Tape a label saying, “You are the apple of my eye” to the top of the apple slices bag. 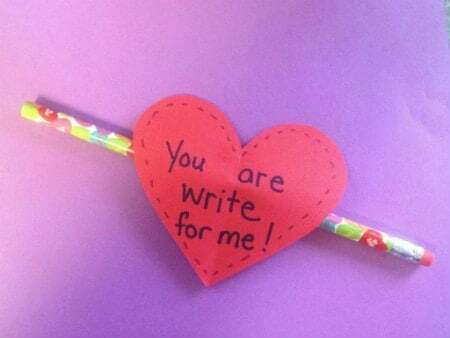 Valentine-themed pencils make great treats for kids, especially when combined with you super easy and cute Pencil Topper note! Check out the instructions on how to make this DIY Valentine’s Day gift! Add some grapes to the bag along with a label that says “You’re my favorite out of the whole bunch.” Grapes are a healthy alternative to candy. Books are one of my favorite non-candy Valentine’s Day ideas for kids because they encourage a love of learning. 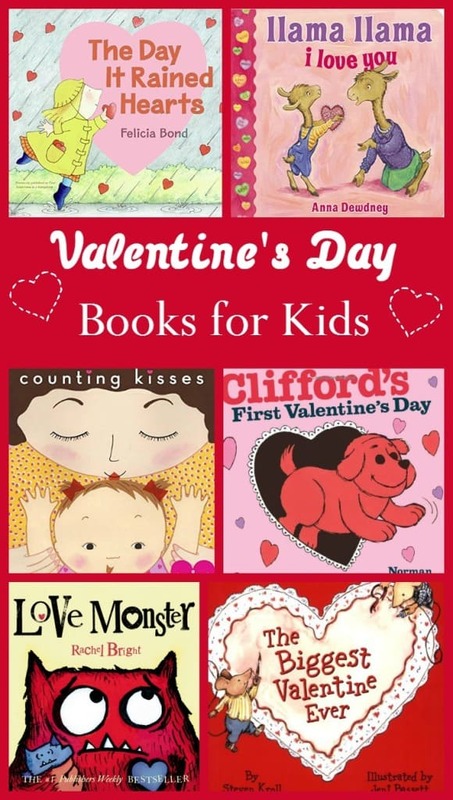 Check out a few of our favorite Valentine’s Day books for kids! These are just a few fun ideas for non-candy Valentine’s Day ideas for kids to get you started. Think outside the chocolate box and you’ll come up with plenty of ways to celebrate the holiday without the sugar rush! I love the idea of giving out books! Books are my love language though. I love books. These are all so cute, especially the pencil one. I cant wait to make Valentines with my daughter this year. P.S. It is hard to comment on your blog because of the social icons bar. It is in the way. Just FYI. My nephew would like cereal (lol) and bubbles (he’s still into them). I was thinking cutting strawberries into heart shapes would also be nice. What a good idea for going candy free! We always do a little candy, a little non candy for a good balance. Great idea! I love finding ideas that aren’t candy, especially since we have a child with a food allergy. Thanks for sharing these! All great ideas but I think I love the pencil idea the best–fun and practical at the same time! These are also great if your kid has a classmate with allergies, no worry about anyone feeling left out! We try and give the kids non-candy treats for Valentines Day. They will be getting so much at school it’s nice to switch things up a bit. I love the idea of books for Valentine’s Day – there are so many appropriate options! Plus, my kids are big readers, and I always love any excuse for a new book! Love these ideas. I think I will do them for my kids this years. I love all these ideas!! Especially the one with the little pencil, perfect as a chool gift! Awesome ideas. We always wound up throwing out candy. What a waste! Wow these are all great ideas! I am still so undecided about what to send into school for my twins. I guess I better get on the ball and decide! I”m the mom known for non-candy ideas. Kids get plenty of candy from other places so I don’t feel the need to add to it. Kids seem to like a little something different mixed in with the candy. Great ideas for Valentine’s Day. Great ideas. I’m always looking for some holiday gift inspiration for my nieces and nephew. I like the idea of books and bubbles. Great post about activities for kids ! These will help engage kids and focus them on creativity and innovation. I love the idea of Valentines books! Also, my school supply obsessed boy would love to get a pencil for Valentines Day! Ah, the pencil with the pun, I love! All those books look adorable too!! I love Valentine’s themed books! Great ideas! We don’t get candy for our kids but they always end up with some from other sources it seems! We love to give books at holidays. Funny you should post today, I was t hinking about what a candy-free VDay would be like. I like this a lot. What a great idea for Candy free ideas for Valentine’s Day. We try to go candy free as much as possible here at home.